Recently a friend asked me what she could make with walnut shells. My first thought was ornaments. After a little more thought, I came up with the idea of place card holders. This place card holder took about a minute to make, literally. Use them at your table setting or give them as hostess gifts. Starting with a walnut shell half, make a groove with the saw at the top of the shell. Saw in one direction, do not saw back and forth. Make the groove deep enough so it will hold a place card. Done. * I don't recommend this project for a child. The craft saw can slip easily. However, you could have a child paint the walnuts gold if you wanted. Here's the place card I made for the project. You're welcome to use it. Just right click, copy and save. You might need to shrink the image down. Print out on a heavy card stock. Very clever! Perfect for holiday dinner parties. This is the cutest thing I have ever seen. Thank you so much. Oh, and the word verification is TABLE. 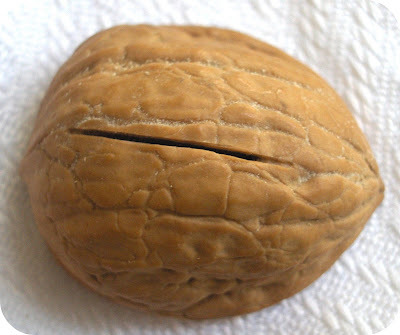 Of couse - you put your walnut onto the table. Great isn't it? Signs every where. Very cute and I love what you come up with. Again with the great stuff! You Rawk! 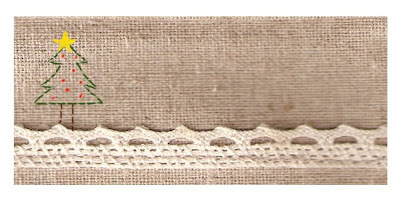 Jessica, I was so inspired by your fabric scrap tags that I used the idea this year for my Christmas gift tags. I posted about them today and linked up to you. Thank you for sharing your wonderful ideas!! Great idea!! I love your name tag too! beautiful! 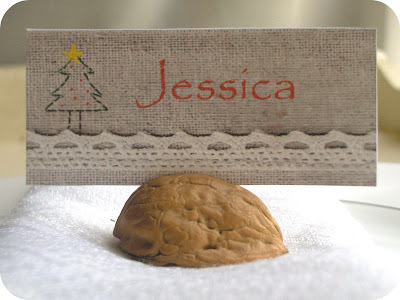 Love that little placecard almost as much as the walnut! Just... amazing .. I love it. Very imaginative. I hope you don 't mind, I have recommended your web, through this article, in my blog. I've also used walnut shell halves to make small candles. Just get some of the melt and pour wax and tea light wicks and they are easy peasy to make. A group of them on a mirrored plate looks nice on the dinner table.